As I headed to The Poisoned Pen on February 24, I was wondering how well my new toy would work. I've been having trouble with my right hand and wrist, and now that writing has become problematic, I bought a (very) small recorder, hoping that (1) I could actually enjoy myself more at events because I wouldn't be scribbling notes madly, and (2) I'd be able to sit at my computer listening to the event and typing it all up for you. We'll see how it goes! As usual, I arrived in plenty of time to get my favorite seat. I did get a bit of reading done, but I also chatted a lot with other fans who arrived early. What made me smile was that author Priscilla Royal came in early and joined our discussion. We had such a great conversation, and the Priscilla Royal fan who was chatting with us didn't realize for a long time that she was talking with the woman whose books she loves! 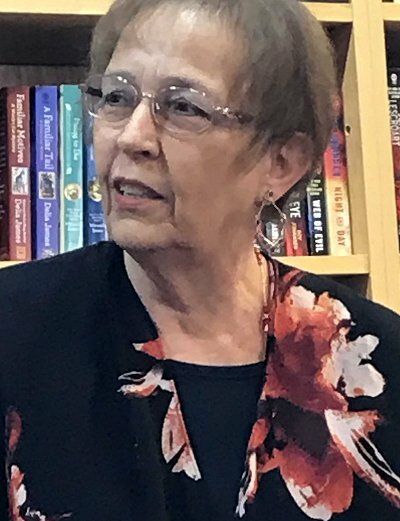 Time flies when you're having fun, and it wasn't long until Barbara Peters arrived with the other two Poisoned Pen Press authors who have new books out, Donis Casey and Dennis Palumbo. 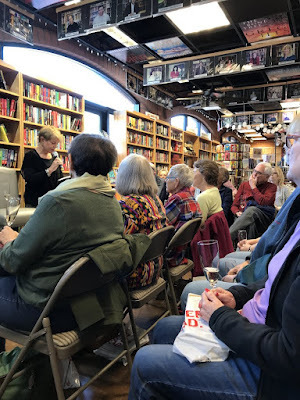 This was not only a launch party for the three authors, it was a celebration of Frederick Ramsay, another talented Poisoned Pen Press author who died late last year. I enjoyed his books, and I loved his sense of humor. Barbara told us that she and Dana Stabenow had just finished Ramsay's last book, Countdown. A few words were spoken by Ramsay's widow as well. 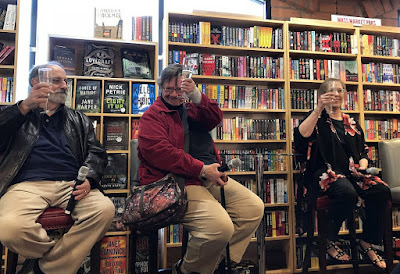 A toast to Fred was drunk by us all, and then it was time to talk new books. L to R: Dennis Palumbo, Priscilla Royal & Donis Casey toasting the memory of Frederick Ramsay. Dennis Palumbo flew in from Los Angeles, and while Priscilla took the train from the north Bay Area of San Francisco. The trains often take her (and leave her) in interesting places, but she told us that she'd managed to leave Flagstaff before the big snowstorm hit. Donis is a local author and didn't have much of a commute. 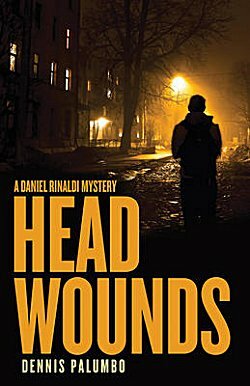 Head Wounds is the fifth Daniel Rinaldi mystery. The series is set in Pittsburgh where Dennis was born and raised, although he and his wife have now lived in Los Angeles for the past forty years. Rinaldi is a psychologist and also a trauma expert-- dating back to the time he and his wife were mugged coming out of a restaurant. His wife was killed, he was injured and found himself having to deal with his survivor guilt. This began his mission to help the victims of violent crime. He is a consultant to the Pittsburgh police. In Head Wounds, Rinaldi discovers that his wife's death was not an accident. "My favorite anecdote is the email I received from a city planner in Pittsburgh who'd read the first three books in the series. I was working on the fourth at the time. In her email she said, 'I'm a city planner; I like your books. But listen... the route that you have Daniel Rinaldi take from his office in Oakmont to his house in Mt. Washington is ridiculous. No one would ever do this, particularly in rush hour!' She drew me a diagram of how Daniel should go home. So starting in Phantom Limb, that's how Rinaldi gets home, and I gave her an acknowledgement on the acknowledgements page in the book!" "That's really hilarious, Dennis," Barbara said. "I've only been to Pittsburgh once or twice. You may think that editors are supposed to fix absolutely everything, but the truth of it is if you don't know it, you trust your author-- 'specially if he's from Pittsburgh-- to get it right. I'm really glad that you get all this unsolicited additional editing." "Oh, I get all sorts of help all the time!" Dennis replied. "It's been a little while since you've published a book. You've had a little sabbatical there," Barbara commented. "I hope you're not going to have another sabbatical...."
"No, but one thing that you have to keep in mind is that I'm a full-time therapist, and I see forty patients a week. I don't have the time to write. I always want each book to be different, so I have to think about them a lot. I don't like thinking; I like writing. Actually, in my life thinking has always got me in trouble. But in this case, I always have to find something that matters to me. "I do hope you get a chance to read my books, and just so you know, when I sign books, I always put one of my business cards inside so you know how to get in touch with me so you can tell me what I got wrong about Pittsburgh." After the laughter died down, Barbara looked at the next author and said, "Priscilla, you don't obviously have this problem. No one is writing to you from the Priory to tell you that, in the fourteenth century, the fish pond was in the southwest corner!" "Well... actually there's a story about that," Priscilla replied. "I do get letters now and then from readers who say 'I'm not sure about this' or 'I'm not sure about that' and sometimes they're right. I appreciate their writing to me. "I'm not an historian by profession, this is a passionate avocation, so even though I care about my details, I do make mistakes. "Since I don't fly, I've learned to love flying over the territory in my books with Google Earth. In the setting for Wild Justice, I wanted to have a stream flowing through the property. An important plot point hinged on that stream, but looking at Google Earth, something bothered me, so I wrote for information. "I was directed to a man in the Visitors Centre there in Somerset who led me to several online maps of the area. What I thought was a stream was something that was built in the nineteenth century. A stream wasn't there in the thirteenth century. I could've made a big mistake, and boy, did I have to change things around!" Priscilla then told us a tiny bit of the fascinating history of the Knights Hospitaller, a religious military order that was founded at Jerusalem in the eleventh century. Yes, they were a military order, but their hospitals were remarkable, and they cared for all, be they Christian, Muslim, or Jew. They also had maternity wards that provided wet nurses and cradles in addition to medical care. Most of the money the order raised went to their hospitals, not the military-- and the transportation of that money has something to do with the plot of Wild Justice. "Prioress Eleanor lives and works in Norfolk, and one of the dilemmas Priscilla faces is to avoid Cabot Cove Syndrome-- which means everyone who lives and visits there dies-- so Eleanor gets to visit her family or do other things in other locations from time to time," Barbara explains. "Prioress Eleanor receives a letter from her brother who is soon leaving to fight in Wales, asking her to take his gift of rents money to Mynchen Buckland Priory in Somerset," Priscilla said. "Eleanor is to give the money to Prioress Amicia only, but when she arrives, she finds Amicia locked in a cell and accused of murder-- something she has never denied doing. But when Amicia reads the letter, she breaks into tears and asks Eleanor to find the guilty person for she is innocent. So Eleanor sets out with her co-sleuth Brother Thomas and her medical person, Sister Anne to solve the crime." 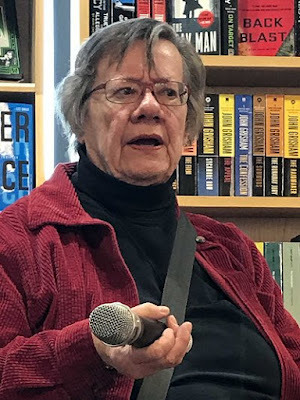 "Some have called Priscilla's books the best medieval mystery series going and a worthy successor to Brother Cadfael," her editor, Barbara Peters said. "Which book is this? The... twelfth?" "Oops!" Barbara said. "Although this is good news for those of you who haven't read the series-- you can binge! 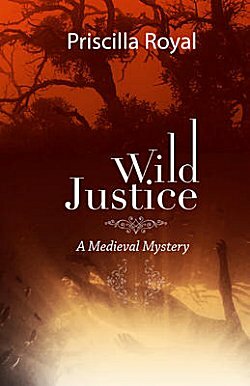 We've also done something different with Wild Justice. We feel that some of our authors have readers who would prefer having the books published as paperbacks with French flaps and other good things, and Priscilla decided that that's what she wanted done for this latest book. You'll see Dennis's book and Donis's book as both hardcover and paperback, and I just wanted you to know that we didn't forget Priscilla-- this was intentional and so far has been hugely successful. The first print run sold out in a flash, so it's something we may be doing more of in the future. "Donis, you've also been getting lots of good press for your latest book." "This has been rather amazing, the reviews I've gotten for this particular book. I'm always very happy, but then I get really really anxious wondering how I can live up to this in my next book," Donis replied. "There's so much that's relevant to today in your book," Barbara said. "Yes. Usually when I do research for my books, I do a lot of reading in old newspapers, but with Forty Dead Men I found myself reading the diaries of men who had fought in World War I, men who had returned home. "There's really a lot more information available about the Brits because-- of course-- they were there a lot longer, and they had a lot more to deal with than we did." 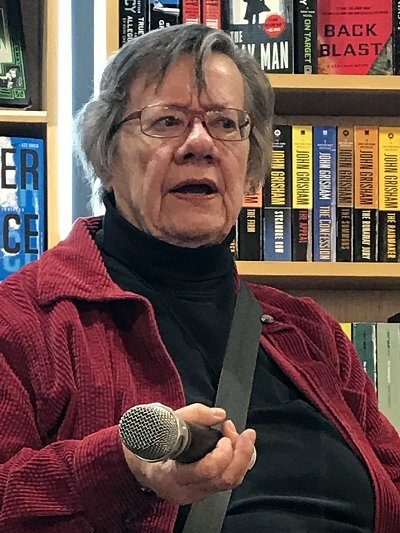 "There's also a wonderful series written by Charles Todd about Inspector Ian Rutledge who returned to England when the war was over," Barbara said. "Well, I didn't want to admit that I had read several Charles Todds," Donis laughed. "Anyway, Alafair's oldest son, Gee Dub (short for George Washington) comes home from the war, and while everyone else thinks he's the same as he's always been, Alafair knows that he's different. He likes to go off by himself, and one day he sees a woman walking down the road in the rain. She's scared of him, so Gee Dub goes to get Alafair. Alafair gets in the buggy and brings her home. The young woman-- Holly-- has traveled all the way from Maine to find out what's happened to her husband. The two got married, he went off to war, and that's the last she knows. Alafair takes Holly into town to see the sheriff, and when Holly tells the sheriff her husband's name, the sheriff informs her that they found the body of a soldier who'd died from the flu by the side of the road a couple of months previously-- and his papers had the same name as Holly's husband." "I'm afraid to say anything else about the story because there are a lot of twisty things in it," Donis admitted. "That's why we're stopping," Barbara said. "This story doesn't go anywhere near where you expect it to go.... Donis has talked with us in each book about one of the children. Sooner or later you're going to run out of children." "I'd like to talk with you about that because Alafair's children are grown, and I think a couple of them are going to have very interesting lives that I'd like to pursue," Donis said. "Of course," Barbara replied, "but we're not going to have an editorial discussion here." Then Dennis had a question for Donis about PTSD which led to us learning that he'd been a screenwriter for several years before becoming a psychologist, and that one of Priscilla's mysteries deals with PTSD as well. Dennis also thought that Prioress Eleanor's co-sleuth, Brother Thomas, is the Archie Goodwin of the series. "I knew that I had to have a man and a woman as sleuths in my books because there are some things men can do in that time period that women can't and vice versa. Eleanor is a highly intelligent, well-educated woman who wouldn't put up with a stupid man for long, but I also didn't want any hanky panky going on in the monastic hayloft," Royal said. "I needed a different angle, and finally Brother Thomas told me, 'I'm gay.' This means that I get to explore the true nature of love in the relationship between the two characters." 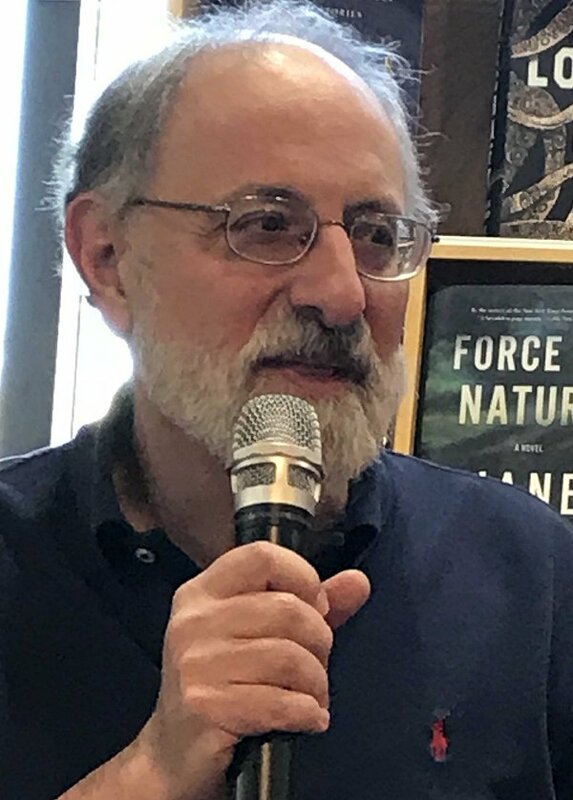 "By the time you've written your third, fourth or fifth book, you're basically taking dictation from your characters," Dennis told us during a short discussion about developing characters over a series of books. Hanging on the authors' words. "I usually end these things with what the authors are doing next," Barbara said, drawing the event to a close. "We already know that Donis and I are going to confer. Priscilla has already sent me one hundred pages of book number fifteen. What's it called, Priscilla?" "The Hanged Man," she replied, "and it's based on a true story of a man who was hanged and lived." "Dennis, you're still searching for an idea for your next book?" Barbara asked. "I do know that I want it to be a situation where Rinaldi is working strictly as a consultant and there's no personal element," Palumbo replied. "I don't think I could survive another book like Head Wounds! Or maybe something in a hospital... holding an entire hospital hostage." And on that note, the afternoon concluded. When I got home, I clicked my little recorder back on and was amazed with the wonderful sound quality. It took me a few years, but I finally came up with a way that allows me to (1) have every spoken word at my disposal and (2) enjoy myself even more at the actual event. Who says you can't teach dogs of a certain age new tricks? So glad your recorder worked, Cathy! And it sounds as though you had a great time at the PP (not surprising). Very happy this went so well. So am I! I don't know what I would do if I couldn't share my visits to The Poisoned Pen! I really enjoyed reading your post on the event! Really enjoy reading these reports of such fun events at Poisoned Pen. And now do I add more books to my TBR mountains. 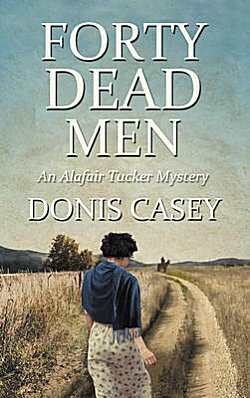 Donis Casey's book interests me. Where is this series set and in what time period? Right after WWI? Rural Oklahoma. The ten-book series starts out around 1910 and Forty Dead Men takes place in 1919.